DeSh~Stoom is a moulded rectangular dish made from unique ceramic, heat-resistant material, with a number of unique components. This material and design ensure that the bread receives exactly the required amount of steam at the right moment. DeSh~Stoom is safe, compact and very simple to use. The only condition is that DeSh~Stoom must be properly preheated for best results. DeSh~Stoom produces steam at the beginning of the baking process. It produces steam after just a few seconds. After about 4 to 5 minutes DeSh~Stoom is completely empty as the water has turned to steam. So no more hassle with ice cubes (which aren’t always to hand and if they are where do you place them! ); the well-known oven-proof or glass dish of water (glass can crack) containing pebbles (has no use because the water that you pour in doesn’t evaporate fast enough; the dish cools off too quickly when you pour in the water and so has little to no effect); the well known water sprayer (dents in the crust, hard crust). 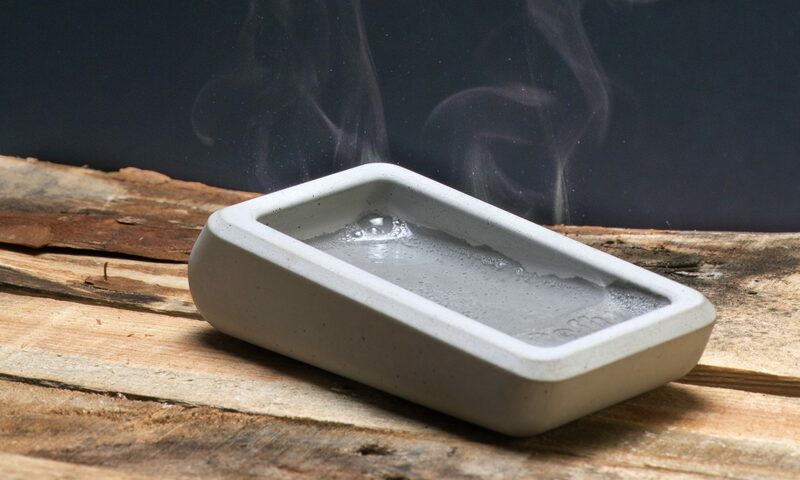 Trays containing lava stones, porous stones that soak up water produce steam for too long because the stones stay wet for too long and you don’t know what substances are released as the stones heat up in the oven. These makeshift solutions may not only damage the oven, with many adverse consequences (warping, rust, dents and cracks in the bottom plate), they fail by far to produce the desired result. When opening the oven door (for example to use the water sprayer) the temperature drops. DeSh~Stoom stays at the right temperature thanks to its unique material and the pre-heating of the oven. I’ve tried all these makeshift solutions myself but non of them in my opinion produce the desired result. DeSh~Stoom stays at the right temperature thanks to its unique material and the pre-heating of the oven. It’s taken me about two years to develop this final product of which I’m very proud. DeSh~Stoom gives the home baker a safe and simple solution that works! No unnatural substances have been added. DeSh~Stoom is safe and has been officially approved for food preparation. DeSh~Stoom is heat-resistant up to 1200°C. It measures 16 cm by 8 cm and is 2.75 cm to 4 cm high. It weighs about 635 gram, so it is very sturdy and stays in place making it safe to work with. The top and sides are polished. The bottom is unpolished so that DeSh~Stoom stays in its place in the oven and doesn’t slide around. Its compact dimensions mean that DeSh~Stoom does not take up too much space leaving plenty of room in the oven for the products that are being baked. DeSh~Stoom can stay in the oven at all times. A must for every home baker. The result is delicious good quality homemade bread with a crispy, thin crust and soft and airy inside. To produce an even crispier crust leave the oven door slightly ajar for the final minute of the baking time. It can also be used for baking par-baked bread and rolls, freshening up old bread (making it soft inside and crispy outside) and pizzas. Quite simply, it is recommended for all (par-baked) breads. It is also suitable for combi microwave ovens and barbecues (gas and charcoal). DeSh~Stoom can be kept in the oven at all times even when baking other things that don’t require steam. Click here for the complete user manual.